This study investigated the utility of microsatellite markers for providing information on levels of population connectivity for a low dispersing reef fish in New South Wales (NSW), Australia, at scales ≤400 km. It was hypothesized that the temperate damselfish Parmamicrolepis, which produces benthic eggs and has limited post-settlement dispersal, would exhibit spatial genetic structure and a significant pattern of isolation-by-distance (IBD). A fully nested hierarchical sampling design incorporating three spatial scales (sites, location and regions, separated by 1–2, 10–50 and 70–80 km respectively) was used to determine genetic variability at seven microsatellite loci. Broad-scale genetic homogeneity and lack of IBD was well supported by single and multi-locus analyses. The proportion of the total genetic variation attributable to differences among regions, locations or sites was effectively zero (Φ/R-statistics ≤0.007). The geographic distribution of genetic diversity and levels of polymorphism (HE 0.21–0.95) indicate high mutation rates, large effective population sizes, and high rates of gene flow. Significant gene flow may be driven by factors influencing pre-settlement dispersal, including the East Australian Current (EAC) and habitat continuity. Genetic connectivity may not reflect demographically important connectivity, but does imply that P. microlepis populations are well connected from an evolutionary perspective. Total observed genetic diversity was accounted for within 1–2 km of reef and could be represented within small Marine Protected Areas. Reef fishes in NSW which have life histories similar to P. microlepis (e.g. pre-settlement durations ≥2 weeks) are also likely to exhibit genetic homogeneity. Genetic markers are, therefore, most likely to provide information on demographically relevant connectivity for species with lower dispersal capabilities, small population sizes, short life spans, and whose habitats are rare, or patchily distributed along-shore. 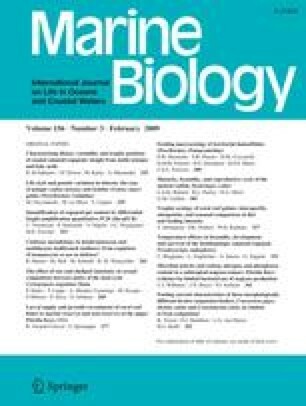 The online version of this article (doi: https://doi.org/10.1007/s00227-008-1090-0) contains supplementary material, which is available to authorized users. We thank Alan Curley for assistance with sample collection, Michael Kingsford and Vanessa Miller-Sims for revising drafts of the manuscript, and Michael Britt for proof-reading the final version. Discussions with Tim Glasby, Lyn Van Herwerden, Dean Jerry, Line Bay and Adam Stow were valuable in establishing appropriate laboratory and/or statistical techniques. Thanks to Marita Holley and Paul Worden for technical assistance. Research was funded by a James Cook University (JCU) Merit Research Grant (M. Kingsford), and a Macquarie University Research Development Grant (M. Gillings). BGC was funded by an Australian Post-graduate Award, JCU School of Marine Biology and Aquaculture Scholarship, JCU Doctoral Completion Award, and a Nancy Vernon Rankine Scholarship. Research was conducted within the Australian guidelines for research ethics and received clearance from the JCU Experimentation Ethics Review Committee (approval number A827).